Oliver used a variety of materials, including paper, resin, tissue, fibreglass, hair, copper and aluminum. 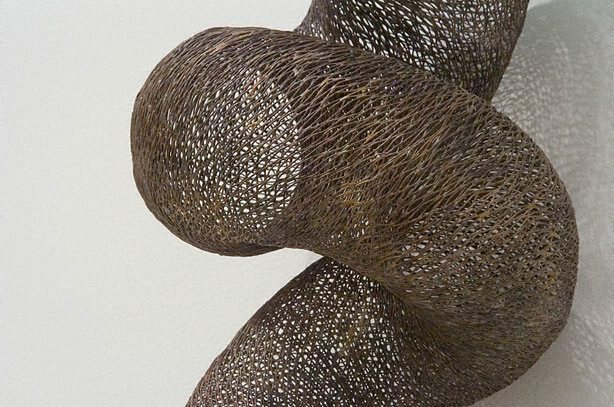 The ethereal impression and supple curves of her objects belie the inherent qualities of their materials and the intensive process of their production. As a result copper appears lithe, its resiliency creatively subverted. In earlier works Oliver transformed paper. ‘Unicorn’ 1984 (AGNSW collection), for example, is made from paper, tissue, wire, hair and cane. It is a bulbous floor piece of three dimensions, with tiny threads of dark hair appearing around the peak of each white marbled globe. Paradoxically, the curvaceous, almost corporeal structure hints at a tangible blooming vitality despite its solid exterior. In contrast to the opaque skin of ‘Unicorn’, ‘Egg carrying object’ 1987 (AGNSW collection) reveals a translucent chest-like cavity with cross-hatched ribs or patterns. These objects of unexpected shapes do not directly imitate nature; nonetheless they impressionistically parallel its surprising dynamism. Oliver has said, ‘When the ideas, the formal elements and the medium all work together a sculpture will “sing” with a kind of rightness. It takes on a life, a presence, which is removed from this world. 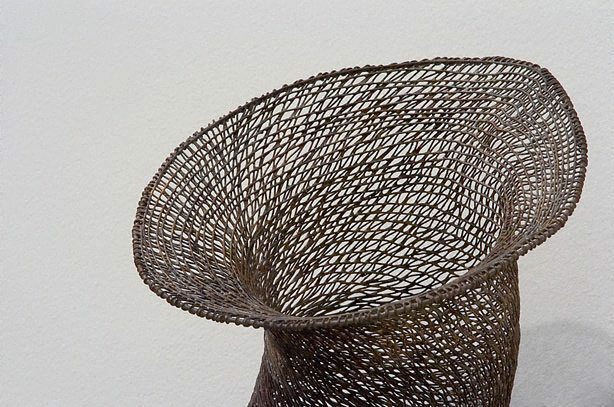 It belongs to a mythical other life, without a place in time’.1 Oliver was interested in structural formation, in the principles of ‘spiralling, wrapping, binding, swelling, expanding and stretching’ – all processes of becoming.2 These meta-morphic dimensions are surmised in ‘Swathe’, made from a web of fine copper wire. Attached to the wall, the object is a long circular limb with a slender tip at one end and an aperture at the other. 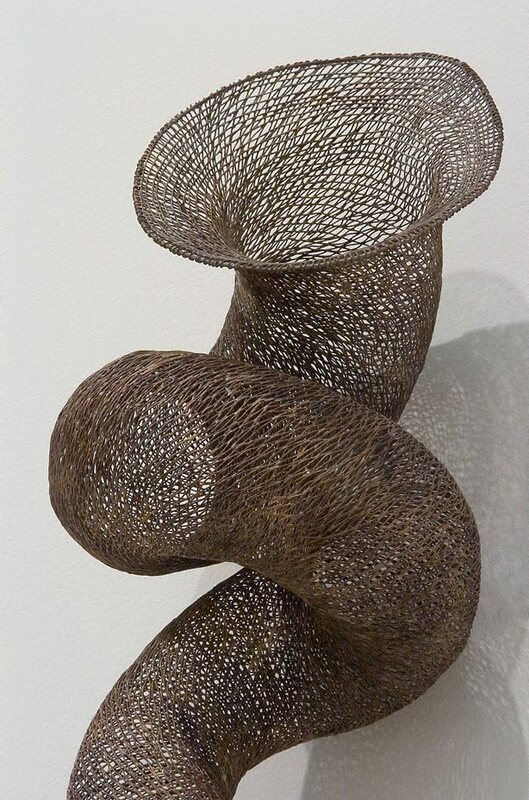 The tentacle-like form curls in on itself at the peak, while shadows and light animate its intense surface texture. Meaning to wrap or bind, ‘Swathe’ is an apt and expressive title, alluding both to the material process of creation and to Oliver’s methodology. 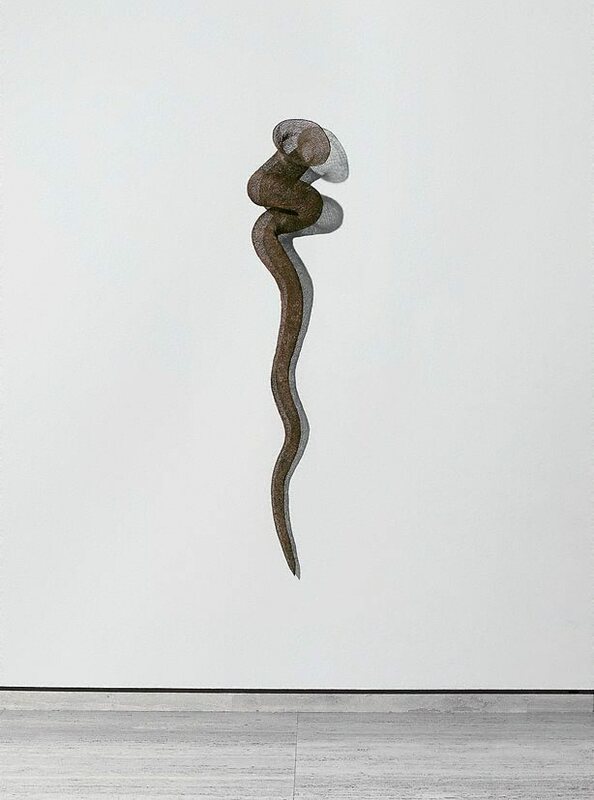 Natasha Bullock, Contemporary: Art Gallery of New South Wales Contemporary Collection , 'Landscape, mapping, nature', pg.290-331, Sydney, 2006, 326, 327 (colour illus. ).